Beef, water, soy sauce, red wine vinegar, brown sugar, black pepper, seasoned salt, spices, and other flavorings. The first flavors that I pick up is seasoned salt that slowly clarifies itself as soy sauce, along with a touch of garlic. 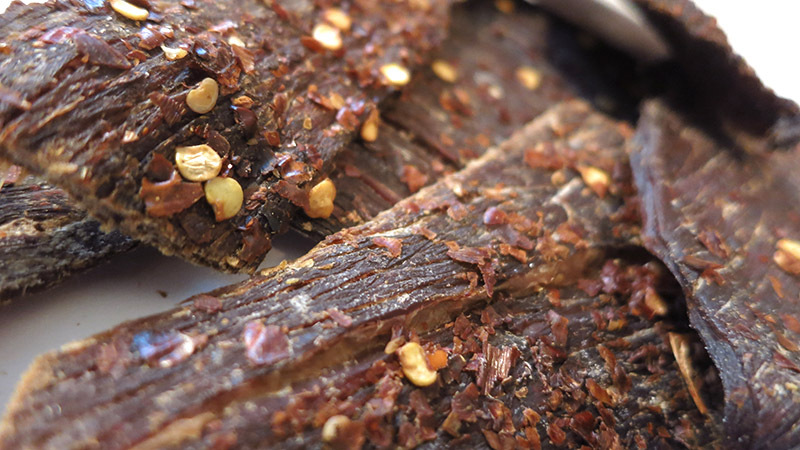 The chewing brings on the natural meat flavors, with a light chile pepper flavor. There's a light bit of heat building up. For being marketed as, "Hot Peppered", it seems to hold up well. The spiciness rates on my personal heat scale as "medium" (level 3 out of 5). There's enough red chile flakes on these pieces, that I get a fair amount of chile pepper flavor. Otherwise, the primary taste profile is a light soy sauce, seasoned up with garlic and other spices. The red chile pepper adds a noticeable flavor with a medium level of heat. The natural meat flavors are also noticeable in the background. The meat consitency looks excellent. Seemingly all meat, sliced into slabs that rip apart from the grain easily, and chew down with a fair amount of ease. It's mostly dry, but still tender, and by the time it chews down, takes on a steak-like texture. I didn't find any stringiness or anything unchewable. This Hot Peppered Beef Jerky from Beefy Boys is a delight for those who love red chile peppers. You get lots of the spice layered on these pieces, enough to effect a noticeable flavor. If you're not used to heat, you could definitely get smoked by this. But if you're a chile pepper aficionado, you'll find that it has just enough heat to keep you satisfied without distracting your attention on the jerky as a whole. 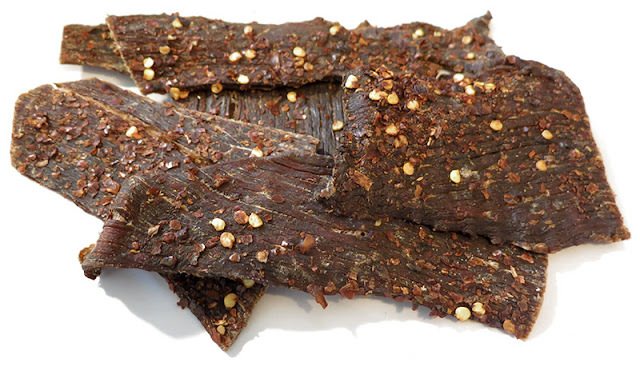 This jerky manages to deliver the natural meat flavors, and a meaty, steak-like chewing texture. 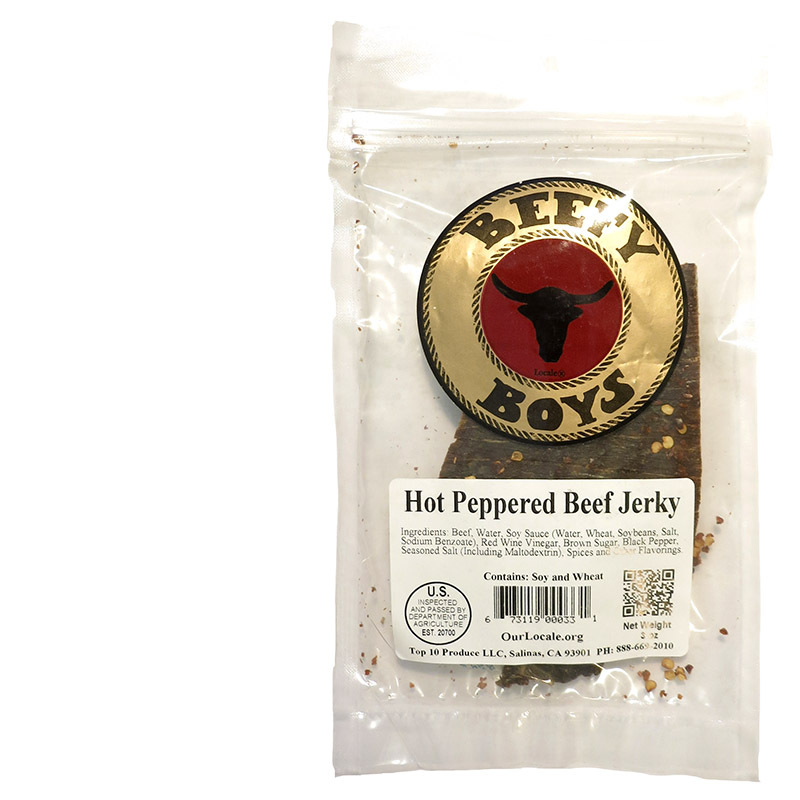 If you like old fashioned slab-style jerky with some kick to it, you'll love this variety from Beefy Boys.